The backlog allows you to easily create and edit initiatives, epics and stories within the main view. Go to Backlog > Initiatives > and click on + Create Initiative. Create more initiatives by typing directly in the empty field and select Enter to confirm. In the initiatives view you can also edit the full plan hierarchy from initiative to story. When switching to the epics view, you receive a flat, fully rank-ordered list of epics again, and initiatives turn into a column. In that view you can easily assign existing epics to a parent initiative. In the graphical schedule, there is an initiatives view. It plots initiatives on the timeline based on when the first epic starts and when the last epic within that initiative is scheduled to be completed. Initiatives can be linked with Jira issues in order to run these through their usual workflow and to populate status up to the roadmap. 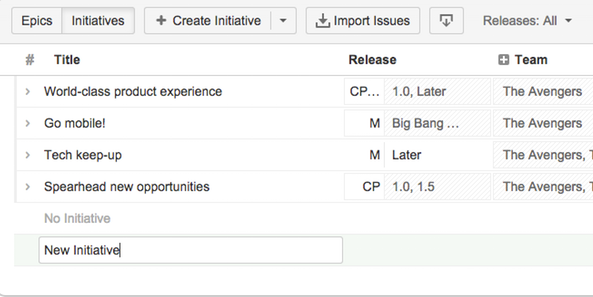 There is no native Jira issue type for initiatives and therefore a "New Feature" issue is created per initiative. However, you can create a custom issue type and use it for initiatives as well. Go to Backlog > Epics > + Create Epic. 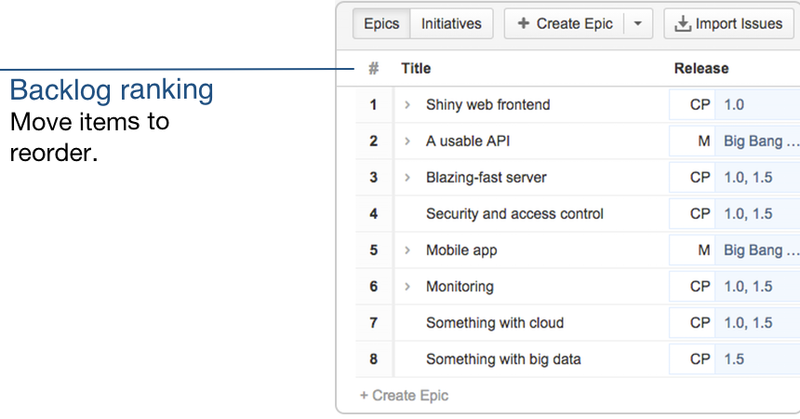 Create more epics by typing directly in the epic field and select Enter to confirm. Once the epic is created, the focus is directly set to add new records. Check the epic details by hovering the mouse over the name and selecting details. If you want to move an epic from one initiative to another, go to the Initiative view, hover the mouse over the epic that you want to move, and click the arrow located at the right side of the epic name. Select Move to initiative, choose the initiative name and click Move. You can do the same action by going to the Epics view, hovering the mouse over the epic that you want to move, and clicking the arrow located at the right side of the epic name. Select Move to initiative, choose the initiative name and click Move. Go to Backlog > Epics and select the epic that you want to add the story to. Select + next to the Epic name. Type the Story name in the field and click Enter. Check the story details by hovering the mouse over the name and selecting details. Alternatively, you can go to + Create Epic, which is located in the filter bar and choose Story from the dropdown list. When moving the mouse cursor between two rows, you can quickly insert a new story in between existing items. Go to Backlog > Epics/Initiatives and hover the mouse over the item you want to delete. Select the right arrow next to the item's name, and click Delete from the dropdown list. if a backlog item is linked to one or multiple Jira issues, these issues are not impacted by the operation. For instance, you can keep completed issues for reference in the system, but don't want to see them on your roadmap any longer, then you can just delete them. Go to Backlog > Epics/Initiatives and select the item from where you want to create new issues. Select the right arrow next to the item's name, and click Create and link new issues from the dropdown list. Select the Jira project where you want to create the issues, select the issue type and choose the filters, once you've finished, click Create and link issues. This feature allows you create actual Jira issues and link them to the plan item, so you can keep track of status and progress while implementation. Since there is no native Jira issues type for initiatives, per default a "New Feature" issue is created. However, you can create a custom issue type and use it for initiatives. See also: Issue Links and Synchronization. Go to Backlog > Epics/Initiatives and select the item you want to mark. Mark the item as done. The (remaining) estimate is set to 0, and it is not considered any longer by the scheduling algorithm. You can reorder and rank the backlog elements by dragging and dropping the items. When dragging epics, all the epic child stories are re-prioritized automatically with the epic as well. Priority ranking via drag and drop is only possible as long as the table is not sorted by any other column. For instance, If you sort by title, as depicted below, you'll not be able to rank-order, until you sort the table again by the priority rank column (labeled with #).